It's very simple to use, simply select a folder with the images you would like to use for the slide show. The distribution of images is done circularly in a three-dimensional space and can be easily adjusted and customized. The number of images is limitless. It creates an After Effects comp so you can do anything you want after it is created, for example replace the images by other elements such as videos for example. Width and Height : defines the width and height of the images. Scrolling : defines the axis of scrolling of the images and in which direction. Speed : applies a running speed up to 10 (very fast). 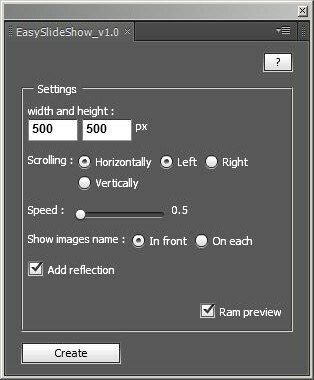 Show images name : To display the name of the images, either in front or on each image. Add reflection : creates a reflection of the main composition. Ram preview : automatically runs a ram preview of the animation. A long list of parameters, placed together seen via the effects panel, allows quick and easy changes. All settings can be modified in the project but the settings of the user interface are taken into account for the creation of compositions. Note: This project uses a lot of expressions, which allows for quick and easy changes. Legal notices: This script is provided "as is" without warranty of any kind, expressed or implied. In no event shall the author be held liable for any damages arising in any way from the use of this script.